Have you ever totally wanted desperately to write about something because it’s all you can think about and it’s practically consuming your waking hours, yet you can’t because what you want so passionately to talk about is not ready to be talked about? Or because a certain person or group of persons might read it and be offended? Or because… It’s infuriating! After all, the very nature of a blog is a journal, really, and yet because it is public, it’s not a journal at all, at least not in the “Dear Diary” sense, and you can’t just go on spouting about any old topic. You have to censor yourself, for goodness sake! So let me try to focus on something else. Hm. Dudley is sitting behind me, licking himself like a fiend with such gusto, you might actually start to believe that they didn’t get it all when we took him to get “fixed.” The sound is stomach churning, filling my mouth with bile at the very slurp, slurp, slurp which my fixated canine is taking such pleasure in. 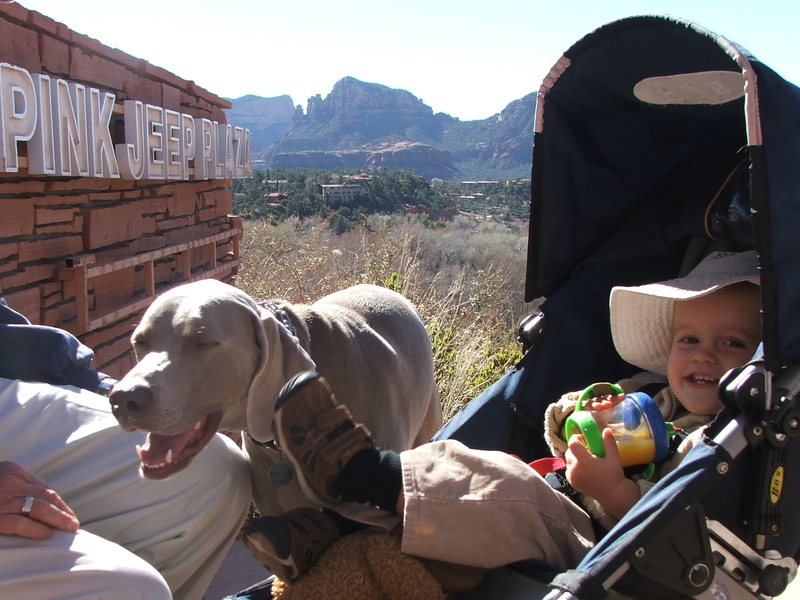 We took Casey’s folks to Sedona this past Friday, and it was just gorgeous. Dudley was the star of the town, getting stopped every few feet to be admired, and Kenny loved the gorgeous views, and getting totted around in his beloved backpack. This is beautiful country out here! Yes, you know I have those un-supressable urges that I’m learning to SUPRESS (mainly because Husband doesn’t want me taken out by an angry crazy). And I’m starting to think Dudley and Lance were separated at birth. I don’t think any breed can lick as loud or as long as a Weim…equipment or no. You look beautiful in the Valentine’s Day pict!